Like at so many important sites, the original number of stones in the circles of Avebury is not known or is unclear, but there are some numbers that make more sense than others and I will use the data that have been used for a long time to argue for an intricate lunar clockwork at Avebury which was based on check and double check and on important lunar cycles. Without excavation the exact number of these major works will never be known, also the number of the Ring of Brodgar is still not known; the survey that has been done now nearly two years ago is not yet published but is already known to be inconclusive with estimates ranging from 60-76. The number of stones in a circle together with its diameter and shape are the only truly straightforward intellectual data that have survived from the Megalithic culture. It are a few outsiders like Alexander Thom and myself, who seem to be the only people who are convinced of the significance of these mathematical data, this must be why the great work of the vilified Thom has not got any serious follow-up, except for the totally isolated and side-lined Euan MacKie, but may be my work will help to change this. If anyone deserves the title of new Nestor of British Archaeology it is professor MacKie, because he has been vindicated in his assessment of the sophistication of Orkney and the work of Alexander Thom. The lunar cycle is extremely difficult to find out, it gave even Newton a headache, so they must have despaired in the Stone Age; this is probably the reason why they finally became very rigorous in their checks and double checks, although they still had to wait 18.6 years to prove their calculations right, which was probably unexpectedly long. The numbers 37 (37.2) and 56 (55.8) come closer to whole year cycles, but only 93 years would do the trick completely. That would have demanded some strong motivation and thorough organization, which may have included some daily routine ritual to be sure every day was counted, but note that this has nothing to do with a cult of the dead or religion the way we understand it now. 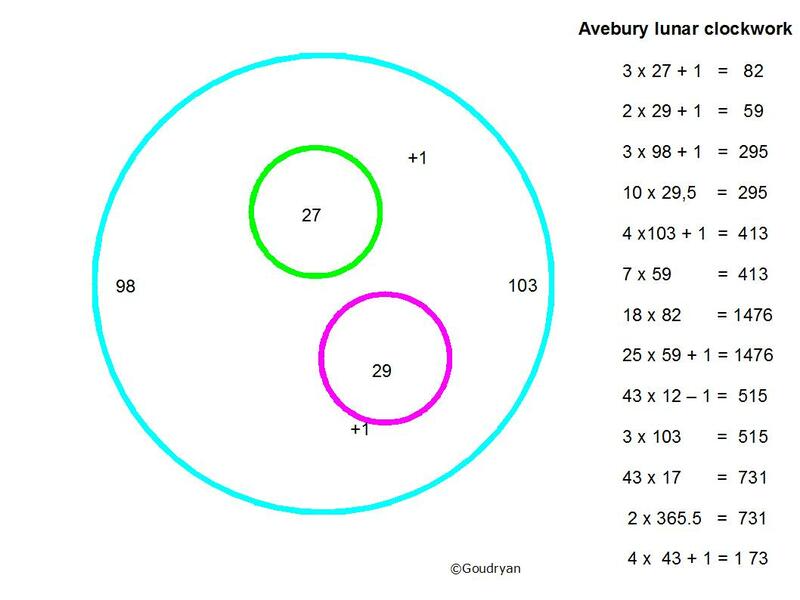 The Avebury circles would be designed for the two moon cycles only, and the three circles would use their outliers as the +1 stone to achieve whole numbers in their calculations. The number 43 occurs prominently in the designs of Stonehenge and Stenness, as radius of the stone circle, this number relates to the year cycle and what Alexander Thom called the ‘danger period’ of the eclipse. It is a recurring number and is traceable in the Sanctuary, which in my view had also check cycles for the Avebury clock. The 56 Aubrey holes of Stonehenge may have been a celebration of the finding of the ‘big’ lunar 3-cycle of 56 years. The number 103 has significance as possibly the number of stones on each side of the Avenue, which is usually given as ‘over a hundred’, giving a total of 206; then: 206 is the number of bones in the human skeleton. So all the numbers in the designs have cyclical, cosmological, arithmetical and mystical significance.